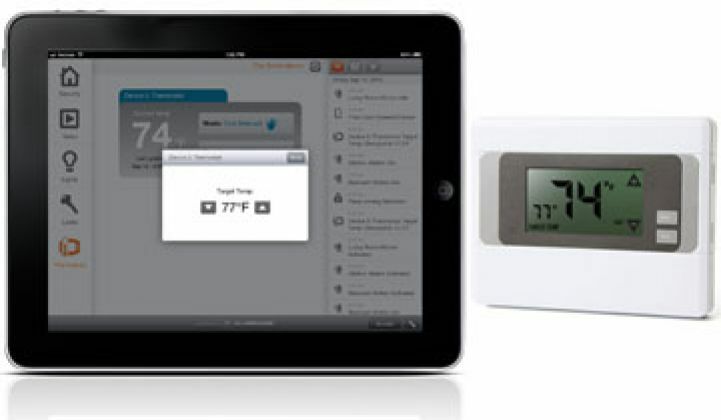 EnergyHub aggregates various thermostats for demand response; Nest joins in too. Southern California Edison is the latest utility to leverage smart thermostats that are already peppered through its territory for residential demand response. Rather than just picking one or two thermostat manufacturers, SCE has teamed up with a range of thermostat makers and service providers for its latest pilot. SCE customers with a wireless thermostat from Alarm.com, Radio Thermostat Company of America, Vivint, Ingersoll Rand: Nexia Home Intelligence, Trane, American Standard and Nest can receive a $1.25 bill credit for every kilowatt-hour saved during peak days, $0.50 more than customers without a two-way thermostat can earn. The rebate program is similar to one that San Diego Gas & Electric already has with Alarm.com and EnergyHub. Each of the participants has branded websites that allow customers to enroll. The program, which will probably run about twelve days a year, could save customers an average of $60 per summer to adjust the AC from 2 p.m. to 6 p.m. during the hottest days of the year. Nest manages its own thermostats, while EnergyHub manages the thermostats through its platform for the other providers. For customers that enroll, EnergyHub may adjust the thermostat by up to 6° F, although EnergyHub usually precools homes based on their individual profiles so that customers don’t feel the effects of the 6-degree temperature adjustment. Customers can opt out of any event. The Brooklyn-based company, which was purchased by Alarm.com earlier this year, already works with Austin Energy, CenterPoint Energy, ERCOT and San Diego Gas & Electric to leverage existing thermostats in those territories for demand response. The program at SCE has the largest collection of thermostat makers and service providers lined up so far, but EnergyHub expects to add more partners this year. SCE was looking to tap the largest install base possible, so it reached out to Alarm.com, Radio Thermostat of America (which runs EnergyHub’s platform) and Nest. The utility will call an event the day before and communicate that to the third parties through an OpenADR 2.0 signal; the third parties, whether EnergyHub or Nest, will then tap the thermostats that have signed up. SCE, which is part of Edison International (NYSE:EIX), hopes to sign up 3,000 customers for the one-year pilot. SCE's Joe Jankosky said he expects to hit the target or get very close. “We wanted to learn different things with different companies and different distribution platforms,” Jankosky said of the decision to cast a wide net of manufacturers and service providers. One of the challenges for SCE and other utilities rolling out programs like this is that smart meter platforms were designed to be able to ping a smart thermostat during a peak event, but systems are not in place to work through a third party. That means that billing systems and back-end systems for demand response must be tailored to go through a third party. Still, although it takes an extra layer of integration, the cost of leveraging already existing hardware for demand response is an attractive proposition for many utilities. Though it is just a pilot, SCE expects to take the lessons learned from this summer and roll out the program to more customers in the future. For forward-thinking utilities, the writing is on the wall that they are not alone in the energy services building -- and that might not be a bad thing.